DENVER – U.S. Sen. Cory Gardner and a bipartisan group of senators on Thursday introduced a new package of sanctions aimed at Russia over its continued interference in American elections and ongoing activities in Syria and Crimea as cybersecurity officials warned that the interference was ongoing. Included in the measure is Gardner’s ongoing request that the State Department undertake a review to determine whether Russia meets the criteria to be designated as a state sponsor of terror—something he’s pushed for since April and which Rep. Mike Coffman, R-Colo., also backed in a measure last week. Gardner, a Republican, introduced the measure alongside Sens. Lindsey Graham (R-S.C.), Bob Menendez (D-N.J.), Ben Cardin (D-Md. ), John McCain (R-Ariz.) and Jeanne Shaheen (D-N.H.). Later Thursday, top American officials continued to warn over Russian interference in U.S. elections systems. Director of National Intelligence Dan Coats said Russia continues “to hack into and steal information from candidates and election officials alike,” CNN reported. And Homeland Security Secretary Kirstjen Nielsen said, “Our democracy is in the crosshairs,” while National Security Adviser John Bolton told Senate Democrats in a letter that President Donald Trump’s administration was working to protect this year’s elections, the Associated Press reported. 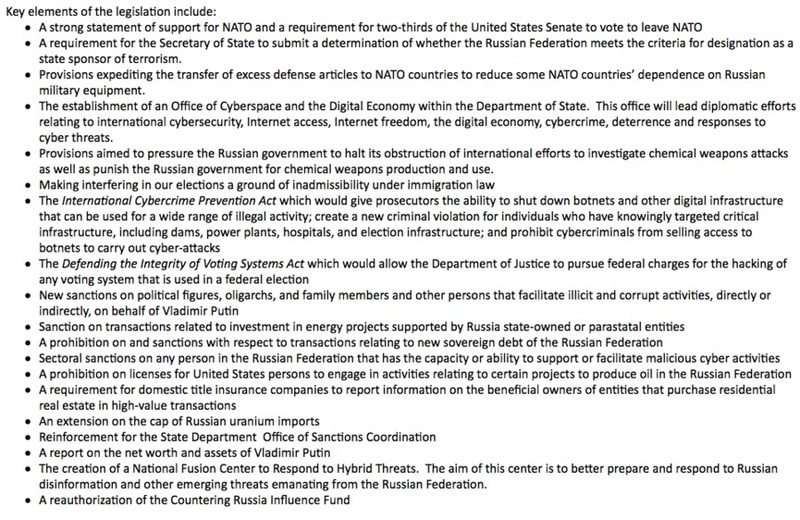 Along with the terror review, the measure introduced by the senators Thursday, the Defending American Security from Kremlin Aggression Act of 2018, does a host of other things sought by both Democrats and Republicans. It implements the requirement that a two-thirds majority vote in the Senate would be needed for President Trump to pull out of NATO. It would also establish a new cyberspace and digital economy office at the State Department, put new sanctions on people connected to Russian President Vladimir Putin and put new restrictions on Americans’ ability to engage with Russian businesses, among a host of other things . Sen. Mark Warner, D-Va., who is the vice chair of the Senate Intelligence Committee, said on Twitter he was pleased with the administration’s news conference on election interference despite the president’s repeated questioning of past election interference.